Multiple myeloma mri contrast - Imaging magnetic resonance (MRI) allow the detection of infiltration of the bone marrow and the focus of the focal absence of osteopenia or osteolysis focus on the study of bone cell standard metastatic (MBS). MRI is a tool that is more powerful for the detection of FL of the MBS. Number of MRI-FL has implications prognostic independent; moreover, the resolution of MRI-FL identify subgroups with survival of the superior. Therefore, we recommend that, in addition to MBS, MRI be used routinely for staging, prognosis, and assessment of response in myeloma. Multiple myeloma (MM) is a malignancy of cells B cells plasma cells refreshing the antibodies that develop in the bone marrow. Symptoms develop as a result of anemia, immunosuppress, kidney failure, hypercalcemia, and the destruction of bone with fracture pathology that is painful. Finally, up to 80% of patients suffering from spine fracture of the vertebrae or fracture of the pathology of the long bones. This happens either as a result of osteoporosis spread or, more generally, in the place of the lesion osteolytic, as a consequence of both activation of osteoclasts and inactivates osteoblasts that di mediation by the interaction of cells mieloma with the microbiology of the bone marrow. Abnormalities can be seen on examination of the study of bone metastatic (MBS) is growing a bit slow in the process of destruction of bone, especially in the spine, when 50% to 75% penyahkelasan focal plane has occurred. Imaging magnetic resonance (MRI) is now already well established as a useful tool for the diagnosis of plasmacytoma of the bone is completely alone and for the evaluation of staging and response against MM nonsecretory. The presence of some lesions of focal (FLS) on MRI (MRI-FLs) in MM cinder defining sub groups with higher susceptibility to progression to MM simtomatik. 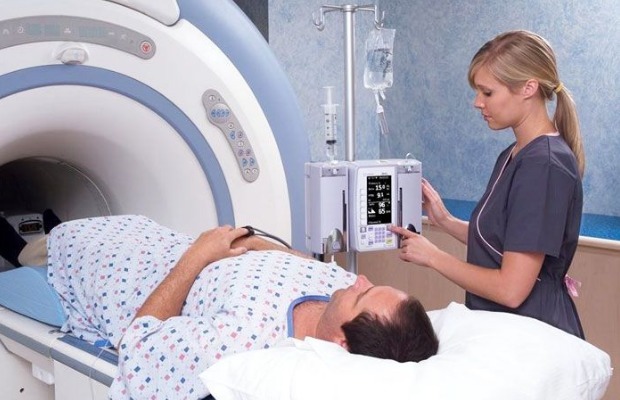 The role of MRI in the staging and management of MM simtomatik has also been shown retrospectively in a group of patients is relatively small. We now report the results of the systematic assessment of a prospective MRI and MBS before and after treatment with Total Therapy 2 (TT2). Between October 1998 and February 2004, 668 newly diagnosed patients (age 75 years or younger, no more than one cycle of therapy earlier) with MM progressive or symptomatic has been registered in the trial TT2. Details about the characteristics and treatment of patients and clinical outcome have recently been reported. All participants gave written consent in writing in accordance with institutional guidelines and the National Cancer Institute (National Institutes of Health, Bethesda, MD). This protocol was approved by the board of institutional review and the Food and Drug Administration of the United States, and monitored by the safety and data monitoring, as required by the National Cancer Institute for testing phase III. Intake MM including electrophoresis protein serum and urine; the Quantity of the level of immunoglobulin in serum, excretion of the urinary protein of 24 hours, the level of serum beta-2-microglobulin (B2M) and C-reactive protein (CRP); And aspirate bone marrow aspiration and biopsy for the interpretation of morphology. These tests, together with a marker of MM, performed at baseline before therapy protocol, before each of the three levels of subsequent treatment and then every 6 to 12 months until relapse. Complete remission (CR) requires the absence of monoclonal immunoglobulin in the analysis immunofixation serum and urine, aspirate bone marrow normal, and microscopic examination of the biopsy the same as the criteria introduced by Blade et al. The return from the CR was diagnosed on the reappearance of monoclonal protein in serum or urine. Fls new or greater on the MBS or MRI, hypercalcemia, bone marrow monoclonal plasmacytosis or the development of lesions of extramedullary all is the additional criteria of relapse from CR or partial remission (PR) and disease progression in the case of the PR still has not yet been achieved. Test MRI basic and MBS are evaluated prospectively. Because of the constraints of time and cost, MRI examination is limited to the marrow of the marrow of the spine as the main site of hematopoiesis is active in the adult, whereas the MBS including the long bones. MRI studies performed with a series of sequences to enable the identification of the involvement of bone marrow focal or diffusion, including spin echo (T1-and T2-weighted [-wt]), gradient-echo (T2-wt), recovery of inversion TI of the short (STIR) , And sequences of echo spin of gadolinium enhanced (with and without suppression of the fat). Exam MBS performed with digital radiography (two views of the chest, the view of the ribs, skull side, and the column vertebrae; and the view of the anteroposterior of the pelvis, shoulders, and legs, including hands and feet). The Data collected includes the location region, number, and size (the dimensions of the axis of the maximum in centimeters to the nearest millimeter) lesions of the intramedullary focus compatible with MM (not including the characteristic lesions of hemangiomas and degenerative disease); regional Location and number of compression fractures of the vertebral body; and the overall characteristics of the signal in the marrow on various sequence imaging (hyper-, iso-, or signal hypointense in contact with the muscles of the paraspinal in the T1-heavy or the signal of the intervertebral discs are normal in the stir, and whether the appearance of the signal is homogeneous or heterogeneous). MRI-FLs with a diameter axial of at least 0.5 cm can be identified in a reliable manner (assuming the absence of masking or other interference). The MRI-FL large can be obscured if the background signal of the cord is similar to the signal MRI-FL due to the diffuse infiltration of the marrow with tumor or other conditions of high water content in the space of the marrow as a consequence of growth factor stimulation or the recovery of bone marrow After chemotherapy. Therefore, although there are exceptions, a diameter of axial 0.5 cm is near the lowest range of reliable detection of FLs both by MRI and by MBS, particularly in terms of reproducibility. Therefore, we do not consider the apparitions focus in MRI or MBS to FL that were less than 0.5 cm in axial dimension due to a rate of false positives unacceptably high. Two groups completely separate from radiologists participated in the reading of magnetic resonance (R. W., A. V. H., E. E., E. J. A.) and MBS exams (three individuals, including A. W.). The response to treatment in MRI involved the normalization of the signal diffuse from the marrow and the decrease in the and/or or number of MRI intramedullary and the sites of tumor extramedullary. MRI-CR defined (MRI-CR) involved the achievement of a hypointense homogeneous background signal in STIR images, and the resolution of FLs. Progression or relapse on MRI was diagnosed when there was an increase in the size and / or number of MRI-FL, or the development of disease extramedullary and / or development of signal marrow diffuse abnormal (adjusted for age in the absence of stimulation iatrogenic cord). The method of Kaplan-Meier was used to estimate overall survival, with group comparisons made using the log-rank test. The overall survival was defined from the date of registration until death from any cause; survivors were censored at the time of last contact. Univariate analyses and multivariate prognostic factors were performed using Cox regression. The prognostic factors standard of overall survival was dicotomizaron using cut-off points. The cut points for albumin and B2M were based on those reported as part of the International Staging System; The points of cut for the remaining variables were based on the predicted optimal outcomes (cut points biological). The cumulative incidence of CR was estimated using the method outlined in Gooley et al and compared using the log-rank test. We used a test of χ2 to compare the number of MRI-FL in relation to the baseline parameters.